Tempat berbagi ilmu tentang pendidikan, opini, kesehatan, film, teknologi. Artikel ini lanjutan artikel sebelumnya tentang bahasa isyarat, bahasa tertulis dan Tuna Rungu. Artikel kali ini membahas hubungan antara bahasa dengan otak, diantaranya bagaimana proses produksi bahasa di otak dapat terbentuk. Semoga dapat membantu khususnya bagi para mahasiswa Bahasa Inggris dan umumnya bagi seluruh peminat bahasa. Silakan dikaji dan mohon kritik serta sarannya . Handedness (left or right-handed) is directly related to the structure and development of the brain. From the top of the spine upwards are the medulla oblongata, the pons Varolii, the cerebellum and the cerebral cortex (cerebrum) in that order. The cerebral cortex is characterized by a division into halves, termed hemispheres, which are connected by tissue called the corpus collosum. It is not evident exactly how important the actual size and weight of the brain are, perhaps the ratio of brain to body size and weight which is important. Size of the brain alone is not the crucial factor which would explain human language and non-human lack of language. Structural differences must exist which account for intelligence, language and other highly cognitive functioning. The left hemisphere controls the right side of the body, including the right hand, the right arm and the right side of the face, while the right hemisphere controls the left side of the body. For right-handed persons, the left hemisphere generally dominate the right hemisphere, with the result that those people tend to prefer their right hands. The majority have left-brain dominance but their dominance is much less marked than in naturally right-handed persons. This lack of strong dominance for left-handers is believed to be a factor contributing to speaking problems and to various reading and writing dysfunctions, such as reversal of letters and words when reading and writing. Also, some studies suggest that there are differences between the brains of males and females. Females normally have a thicker left hemisphere (one specialization of which involves general sensory functions) and males have a thicker right hemisphere (one specialization of which involves visual-spacial functions). Language, logical and analytical operations, and higher mathematics, for example, generally occur in the left hemisphere of the brain, while the right hemisphere is superior at recognizing emotions, recognizing faces and taking in the structures of things globally without analysis. This separation of structure and function in the hemispheres is technically referred to as lateralization : incoming experiences are received by the left or right hemisphere depending on the nature of those experiences, be they speech, faces or sensations of touch. Associated with lateralization is what might be termed ‘earedness’, where right-handed persons with lateralization for language in the left hemisphere will perceive more readily speech sounds through the right ear than the left. The main language centers in the left hemispheres are Broca’s area, in the front part of the brain, Wernike’s area, towards the back, and the angular gyrus, which is even further back. Broca’s area and Wernike’s area are connected by tissue (the arcuate fasciculus). These areas are not found in the right hemisphere. Generally, only the left hemisphere is used for speaking and writing. 1. The front part of the parietal lobe, along the fissure of Rolando, is primarily involved in the processing of sensation, and may be connected with the speech and auditory areas at a deeper level. 2. The area in front of the fissure of Rolando is mainly involved in motor functioning, and is thus relevant to the study of speaking and writing. 3. An area in the upper back part of the temporal lobe, extending upwards into the parietal lobe, plays a major part in the comprehension of speech. This is ‘Wernicke’s area’. 4. In the upper part of temporal lobe is the main area involved in auditory reception, known as ‘Heschl’s gyri’, after the Austrian pathologist R.L. Heschl (1824-1881). 5. 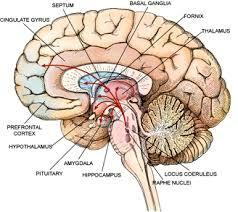 The lower back part of the frontal lobe is primarily involved in the encoding of speech. This is ‘Brocha’s area’. 6. Another area towards the back of the frontal lobe may be involved in the motor control of writing. It is known as ‘Exner’s centre’, after the German neurologist Sigmund Exner (1846-1926). 7. Part of the left parietal region, close to Wernicke’s area, is involved with the control of manual singing. 8. The area at the back of the occipital lobe is used mainly for the processing of visual input. Wernicke observed that Broca’s area was near that part of the brain which involves the muscles which control speech while the area which he identified, later called Wernicke’s area, was near the part of the brain which receives auditory stimuli. Based on these observations, Wernicke hypothesized that the two areas must in some way be connected. Later research showed that they are indeed connected, being connected by the arcuate fasciculus. Some of the neural pathways that are considered to be involved in the processing of spoken language. 1. Speech production. The basic structure of the utterance is thought to be generated in Wernicle’s area and is sent to Broca’s area for encoding. The motor programme is then passed on to the adjacent motor area, which governs the articulatory organs. 2. Reading aloud. The written form is first received by the visual cortex, then transmitted via the angular gyrus to Wernicle’s area, where it is thought to be associated with the auditory representation. The utterance structure is then sent on to Broca’s area. 3. Speech comprehension. The signals arrive in the auditory cortex from the ear, and are transferred to the adjacent Wernicle’s area, where they are interpreted. Although most language processes occur in Broca’s area, Wernicke’s area and the angular gyrus, some language functioning does occur elsewhere in the left hemisphere, and some even occurs in the right ‘non-language’ hemisphere. Five years could not be a critical age because it is a commonplace observation that children learn a second language easily until about 12 years of age and that almost everyone can learn some or most of a second language after that age. Children are generally better than adults at acquiring native-speaker pronunciation in a second language. Language disorders, known as aphasias, are presumed to have as their cause some form of damage to some specific site in the hemisphere where language is located. Such damage causes characteristic problems in spontaneous speech, as well as in the understanding of speech and writing. Broca’s aphasia is characterized by meaningful but shortened speech and also occurs in writing. There is a loss of syntactic knowledge in both speech production and understanding for those with Broca’s aphasia. Interestingly, people with Broca’s aphasia can often sing very well, even using the same words and structures which they are unable to utter in conversation. This condition is characterized by speech with often resembles what is called nonsense speech or double-talk. It sounds right and is grammatical but it is meaningless. It can seem so normal that the listener thinks that he or she has, as is often the case in ordinary conversation, somehow misheard what was said and therefore did not understand it. Patients with Wernicke’s aphasia also commonly provide substitute words for the proper ones on the basis of similar sounds, associations or other features. Damage to the area which leads into wernicke’s area from the auditory cortex may result in pure word deafness, where one cannot recognize the sounds of words as speech but can hear other types of sounds. A condition known as conduction aphasia is characterized by a poor ability to repeat words despite relatively good comprehension. Anomic aphasia involves problem in finding the proper words for spontaneous speech, even though language comprehension and repetition are good. Apraxia is inability to respond appropriately to verbal commands. Global aphasia is a terrible condition in which many or all aspects of language are severely affected, presumably due to massive damage at numerous sites in the left hemisphere or to critical connections between language areas. The type of aphasia which involves disorders in reading and writing is called dyslexia. It may be subdivided into two basic categories: alexia, which involves disorders in reading, and agraphia, which involves disorders in writing. The localist model is the particular model of looking at the structure and function of language by relating specific aspects of language to certain localized areas of the brain. Although it is true that certain areas of the brain are involved in language, it is also necessary to take into account holistic or global brain phenomena in order to understand the effect on language of broader psychological factors, such as attention span, motivation, alertness, the rate at which auditory and visual memory traces dissipate, etc. A holistic type of model does just this. Native signers of American Sign Language who have suffered trauma such as a stroke (cerebral infarction) to the left hemisphere will produce sign language equivalents of Broca’s aphasia or Wernicke’s aphasia. Signers who have suffered damage to the right hemisphere generally do not display aphasia symptoms in the production of signs. The oldest method, that used by Broca himself, is the post-mortem examination of the brain of patients who had displayed language disorders while they were alive. A person might require—because of an accident or a tumour for example—the removal of a lobe of the brain (lobectomy) or even of an entire hemisphere (hemispherectomy). A more recent method, pioneered by Penfield in the 1950s, involves the electrical stimulation of the cerebral cortex in patients who are conscious during brain surgery (electroencephalography). CT (best known as CAT, Computerized Axial Tomography) and PET (Positron Emission Tomography) are the most widely used in this regard. A CAT scan involves using an X-ray source so as to make numerous slice scans, the images of which are integrated by computer to construct an image of the whole brain or portion of it. The PET procedure involves injecting a mildly radioactive substance into the blood and then tracing the blood flow patterns within the brain by means of special detectors surrounding the person’s head. 1. The brain distributes language processing over a few or many cerebral areas. According to researcher George Ojemann, many additional areas of the brain, besides Broca’s and Wernicke’s areas, are involved in language. 2. Second languages are rather loosely organized in the brain. A second language can even be localized in the right hemisphere. Without brain, there would be no mind. Is there a perfect correlation between a person’s experiences and the events which take place in the brain? While there is strong evidence of a general dependence of mental occurrences on the functioning of the brain, it has never been shown that the correspondence is so exact that from observation of a person’s brain one could arrive at a knowledge of the person’s experiences in every detail. Are events in the mind wholly determined by other events? The determinism of events can be physical or it can be mental, or both, depending on whether one takes a dualist or monist view of the universe. Artikel kali ini adalah tulisan Kang Ferdiansyah Jaman Baheula . Silakan dikaji dan mohon kritik dan sarannya.1. Bahasa dapat dikaji dari berbagai sudut dan memberi perhatian khusus pada unsur-unsur bahasa yang berbeda-beda. Dengan begitu lahir beberapa cabang ilmu lingusitik. Sebutkan dan jelaskan minimal 4 (empat) cabang ilmu linguistik yang anda ketahui !Jawab : Fonologi mempelajari buny-bunyi bahasa; morfologi mempelajari bentuk-bentuk kata; sintaksis mempelajari penggabungan kata-kata menjadi kalimat-kalimat yang berbeda-beda; dan tipologi bahasa yang mempelajari persamaan dan perbedaan antara bahasa. A. Kelebihan dan Kekurangan Metode Mengajar InquiryMetode mengajar inquiry mengandung proses mental yang tingkatannya cukup tinggi. Proses mental yang ada pada inquiry diantaranya : merumuskan masalah, membuat hipotesis, mendesain eksperimen, melakukan eksperimen, mengumpulkan dan menganalisis data, dan menarik kesimpulan. Dalam pembelajaran inquiry, kegiatan belajar mengajar harus direncanakan agar siswa memperoleh pengalaman, sehingga berkesempatan untuk mengalami proses inquiry.Dalam pembelajaran inquiry, guru jarang menerangkan tetapi banyak mengajukan pertanyaan. Dengan pertanyaan, guru dapat membantu siswa dalam berpikir. Guru dapat mengajukan pertanyaan yang sesuai pada setiap individu siswa, sehingga mampu mengorganisasi pendapat serta dapat meningkatkan pengertian terhadap segala sesuatu yang sedang dibahas. Dan siswa mampu menemukan sendiri konsep/prinsip yang direncanakan guru untuk dimiliki siswa.